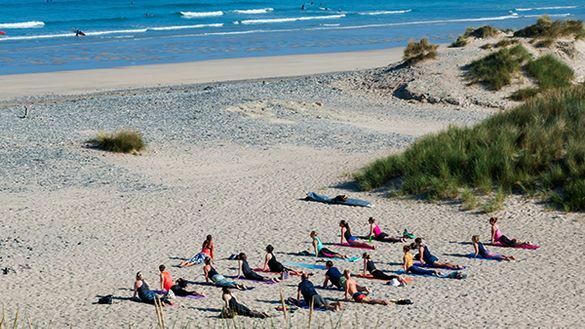 Cornish Gems has teamed up with experienced yoga teacher and clinical health psychologist, Alicia Ray, to offer two NEW wellness breaks by the sea in Cornwall. For the first time, yogis of all levels can relax and rejuvenate on a three-night luxury yoga and wellbeing break in a secluded coastal location in Cornwall in a luxury Scandi-style lodge with a private hot tub and log burner. The exclusive January 2019 weekend breaks include eight yoga and meditation sessions (including beach yoga), deliciously healthy meals and two mindfulness and wellbeing workshops from £390 per person. Kickstart the new year and rejuvenate by the coast with Cornish Gems’ new three-night luxury yoga and wellbeing breaks in Cornwall (January 2019). Yoga enthusiasts of all levels can enjoy a three-night, half-board yoga and wellbeing break in a luxury scandinavian lodge with a private hot tub and log burner. Set in a secluded coastal location seconds from the sea in Cornwall these new January weekend breaks from Cornish Gems offer a weekend of relaxation, restoration and reconnecting with nature with renowned yoga teacher and clinical health psychologist, Alicia Ray. The breaks include eight yoga and meditation sessions, two mindfulness and wellbeing workshops and healthy and hearty meals such as baked banana porridge and Sri Lankan monkfish curry. Beach yoga and guided coastal walks are also included to ensure guests fully enjoy all the benefits of the fresh Cornish sea air and beautiful setting. The accommodation and location for the workshops is at Cornish Gems’ collection of contemporary, interior-designed lodges, Sandy Acres. Set in the tranquil white sand dunes of Gwithian near St Ives the eight Sandy Acres lodges sleep six in three ensuite superking bedrooms and all have a private hot tub, log burner and veranda. The lodges are perfectly situated for switching off, stargazing or exploring Cornwall’s beautiful coast. The weekend breaks are available to book now for Friday 18th to Monday 20th January 2019 and Friday 25th to Monday 28th January 2019. Prices start from £390 per person and options to book an ensuite room or the whole lodge are available. To book or for more information contact Cornish Gems www.cornishgems.com, email enquiries@cornishgems.com or call 01872 241241. For more inofrmation on Alicia Ray visit www.aliciaray.uk. For more information on pricing, accommodation, breakfast and dinner menu and terms and conditions visit the Luxury Yoga and Wellbeing Break page on Cornish Gems’ website, here or contact Philippa Snell on philippa.snell@cornishgems.com or call 01872 241241 ext. 203.